Shiro Maekawa (前川 司郎) is a game planner. He joined Sega in April 1993 and left in March 2008, currently working at Marvelous. Originally wanting to become an animator, he gave up on that profession as he felt he lacked the required drawing skills, but upon learning that unit direction (storyboards) and storytelling does not require great drawing ability, he took the opportunity of being in charge of Sonic Adventure 2's story. Prior to working on Sonic, he wrote some event dialogue for Panzer Dragoon. 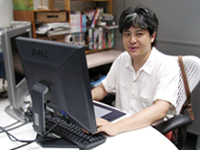 Upon returning to Japan from Sega Studio USA in 2004, he had more involvement in the production of second season (third season outside of Japan) of Sonic X, having weekly scenario meetings.